Another Russian-made resupply ship for the International Space Station was successfully launched into orbit today, beginning a longer-than-usual trek to catch up with the outpost. Flying atop a Russian Soyuz U booster, the Progress M-02M spacecraft rocketed away from the Baikonur Cosmodrome in Kazakhstan at 1837 GMT (2:37 p.m. EDT). 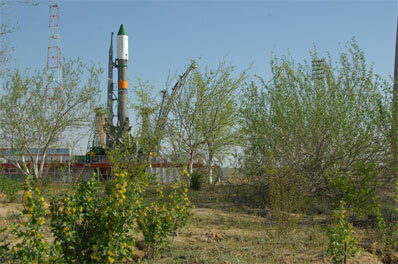 A preliminary orbit was achieved after a nine-minute ascent provided by the three-stage rocket. Onboard commands then extended the Progress craft's two power-generating solar arrays that span 35 feet and unfurled communications and navigation antennas. But instead of aiming for a docking with the station two days after launch, this freighter will spend a few extra days in free-flight to test new avionics, according to NASA. A series of precise engine firings spread over today, Friday and Monday will guide the Progress toward its automated linkup. The docking is planned to occur next Tuesday at 1923 GMT (3:23 p.m. EDT). The 24-foot long ship will attach itself to the Earth-facing port on the Pirs docking module, a spot vacated by the previous Progress vessel that undocked Wednesday. The old vehicle, packed with trash, will remain in orbit through May 18 to perform some experiments on the interaction between the craft's engine firings and the plasma environmental around Earth, NASA said. Today's launch, known in the station's assembly matrix as Progress mission 33P, will deliver two-and-a-half tons of supplies to the station. The "dry" cargo tucked aboard the Progress amounts to 3,384 pounds in the form of spare parts, life support gear and equipment hardware. The refueling module carries 1,918 pounds of propellant for transfer into the Russian segment of the complex to feed the station's maneuvering thrusters. And the vessel has 110 pounds of oxygen and air. The space station is occupied by the Expedition 19 crew of commander commander Gennady Padalka and flight engineers Michael Barratt and Koichi Wakata. Padalka will be standing by Tuesday to manually dock the Progress if the automated system experiences a problem.